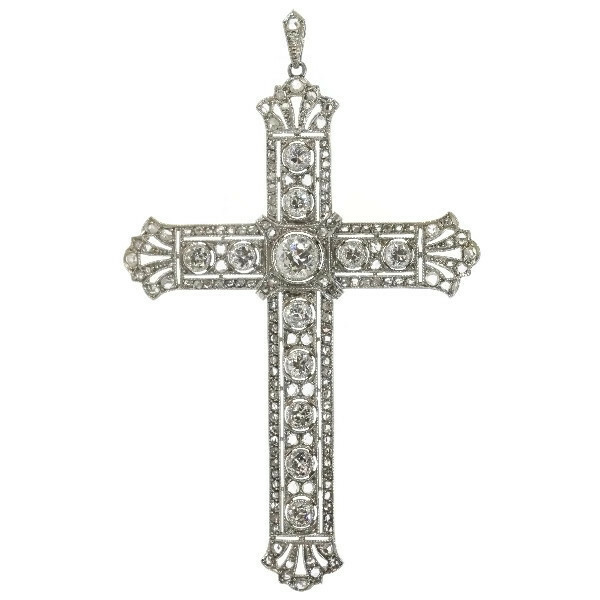 Art Deco Edwardian vintage diamond cross platinum and 18K white gold: Description by Adin Antique Jewelry. Style: Between Edwardian and Art Deco - The Edwardian era or Edwardian period in the United Kingdom is the period covering the reign of King Edward VII, 1901 to 1910. The death of Queen Victoria in January 1901 and the succession of her son, Edward, marked the start of a new century and the end of the Victorian era. While Victoria had shunned society, Edward was the leader of a fashionable elite which set a style influenced by the art and fashions of continental Europe—perhaps because of the King's fondness for travel. The era was marked by significant shifts in politics as sections of society which had been largely excluded from wielding power in the past, such as common labourers and women, became increasingly politicised. Art Deco is an eclectic artistic and design style which had its origins in Paris in the first decades of the 20th century. The style originated in the 1920s and continued to be employed until after World War II. The term "art deco" first saw wide use after an exhibition in 1966, referring to the 1925 Exposition Internationale des Arts Décoratifs et Industriels Modernes that was the culmination of high-end style modern in Paris. Led by the best designers in the decorative arts such as fashion, and interior design, Art Deco affected all areas of design throughout the 1920s and 1930s, including architecture and industrial design, as well as the visual arts such as painting, the graphic arts and film. At the time, this style was seen as elegant, glamorous, functional and modern. Style specifics: As for its elegant design, this jewel has the finesse of an Edwardian piece reacting gracefully against the very geometrical forms of Art Deco that was strongly influenced by Cubism. However, because both Edwardian and Art Deco styles were contemporaries of each other, we sometimes notice pieces - like this one - that carry both influences. Diamond(s): One old European cut diamond with an estimated weight of ± 0.60ct. (colour and clarity: H/I, i/). Nine old European cut diamonds with an estimated weight of ± 1.30ct. (colour and clarity: H/I, vs/i). 144 rose cut diamonds. We do not have the weight of the diamonds which is normal in our trade when it comes to rose cuts.